Sign up for our Newsletter to stay informed of Happy Gardening Tips, new arrivals updates, event notifications, special promotions, and discount coupons. 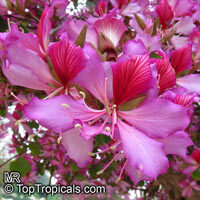 See archives of Top Tropicals Newsletter / Blog. Use Wishlist form to request notification on backordered items. You will receive a one-time email as soon as we have them back in stock.This item is certified for shipping to California. 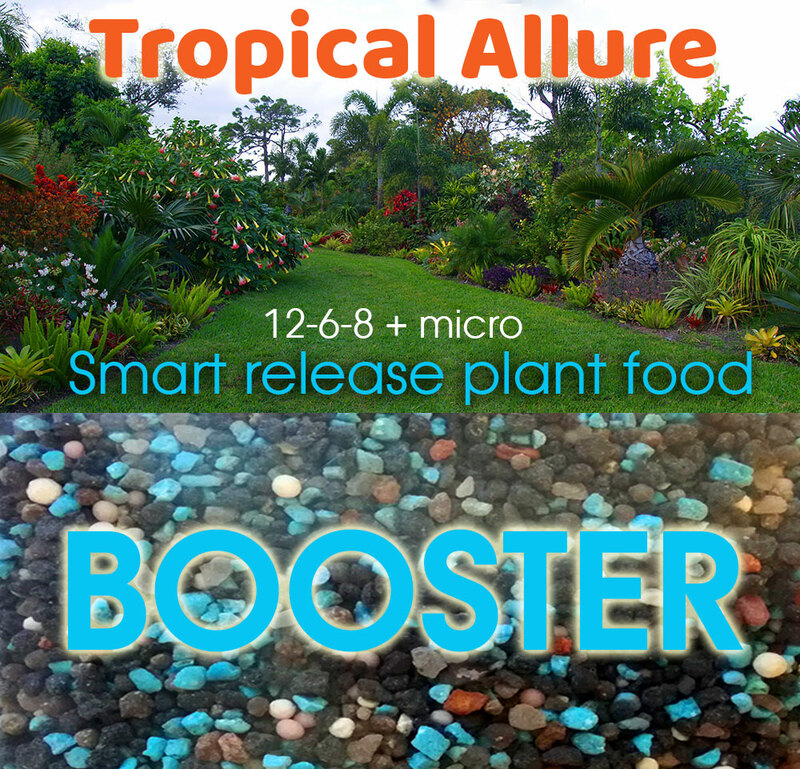 Ornamental 30-day Smart-Release formula with a well-balanced combination of macro- and micro- nutrients. 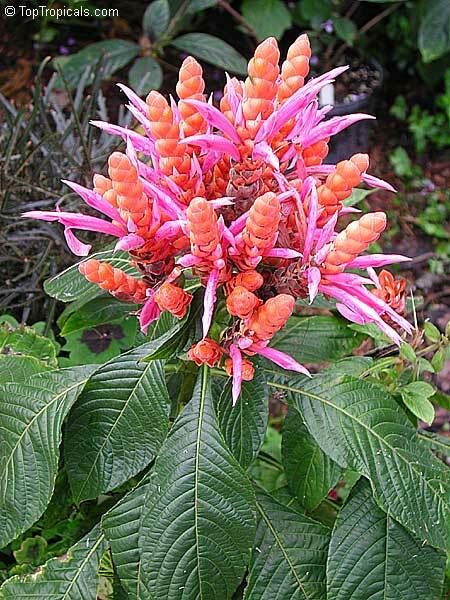 For tropical ornamental trees, woody or herbaceous shrubs and vines. A perfect formula for frequent monthly feed. A slow release action provides continuous feed, maintains vigor and disease resistance. Contains coated nitrogen plus early release nutrients and extra iron (water soluble and chelated) for quick green-up. DIRECTIONS: Apply 1 teaspoon per each 1 gal of soil. 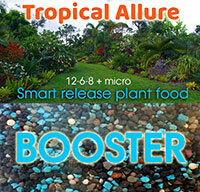 Fertilize once a month from March to October when temperatures stay above 65F. For profuse flowering, use in combination with water-soluble Pink N Good Flower Booster. Water-soluble Micro-elements: Copper (Cu) 0.05%, Magnesium (Mg) 2.408%, Sulfur (S) 6.804%, Iron (Fe) 1.054%, Manganese (Mn) 0.221%, Zink (Zn) 0.108%. 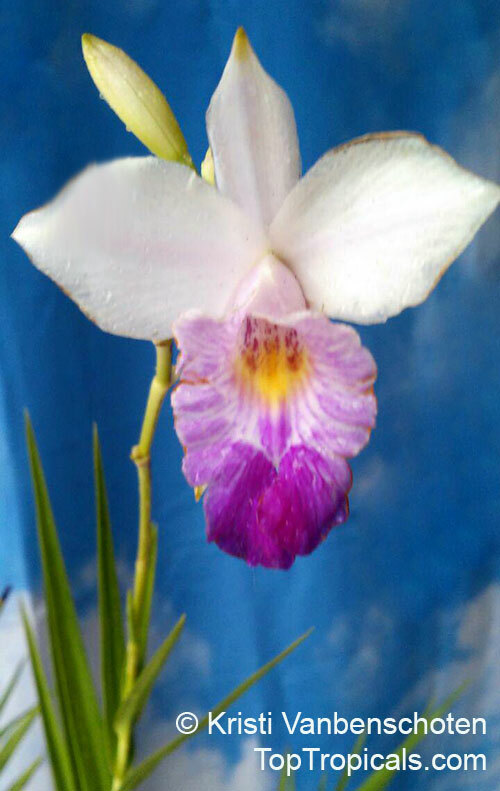 Showy chocolate color slightly fragrant flowers. Large plant, blooming size. 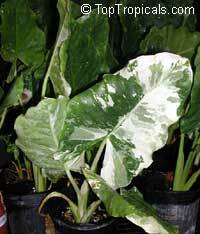 Rare Variegated Elephant Ears, spectacular hybrid. 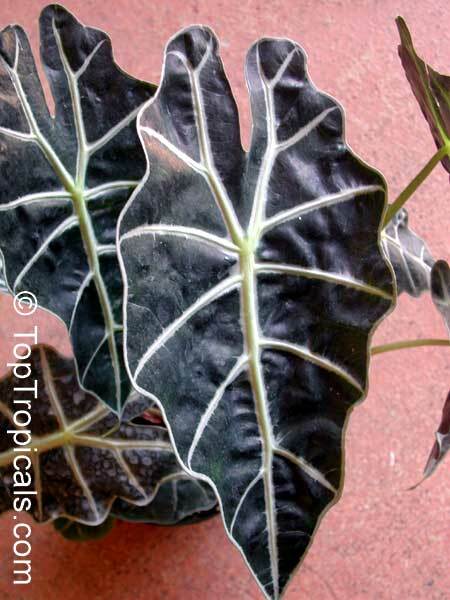 Grows more compact than other Elephant Ears, making it an excellent choice for a large container. 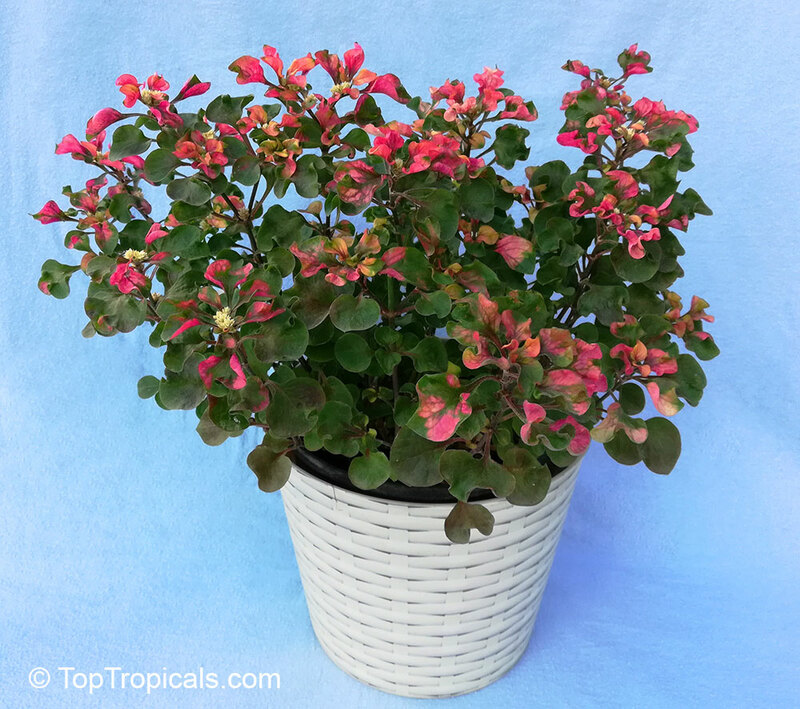 Perfect colorful plant for small spaces and ground cover in both sun or shade locations, this rare variety has amazing colorful foliage with a combination of red, pink, orange, yellow and green! Very rare form that we call "Watermelon". 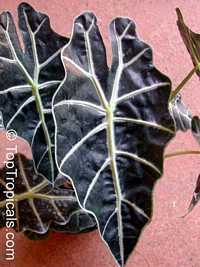 Alternantheras are grown exclusively for their colorful foliage - usually rich purple to burgundy leaves. Spreading foliage mounds to 12-30" tall. 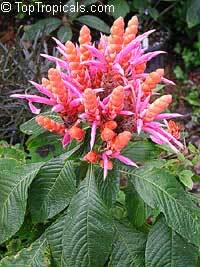 Common names are all in reference to the often brilliantly colored leaves which provide foliage contrast to gardens and container plantings. Best foliage colors are developed in full sun. May also be grown indoors as a houseplant. Pinching stems or shearing will keep plants compact and bushy. Pineapple Royal Hawaiian. 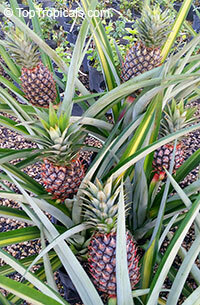 Nothing says exotic and tropical like this edible pinepple - the most desirable and commercially grown variety. It can be successfully grown in a pot. Colorful, spineless (!) foliage and delicious fruit. The most popular variety. Red Custard-Apple. 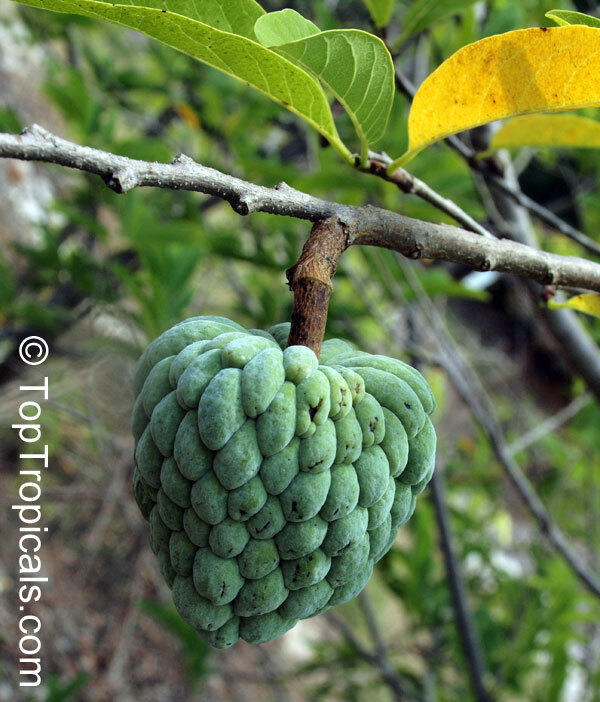 Very rare fruit similar to Sugar Apple. Bigger fruit with dark red skin and pulp, superior flavor. Erect growing tree, rounded to spreading. 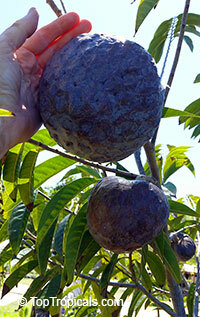 The fruit is 4" to 6" in diameter, roundish to heart-shaped to irregular. Flesh is thick creamy-white and custard-like. Red fruits sometimes have pink flesh or red lines running through the flesh. Season: Late Winter to Spring. Sugar Apple. 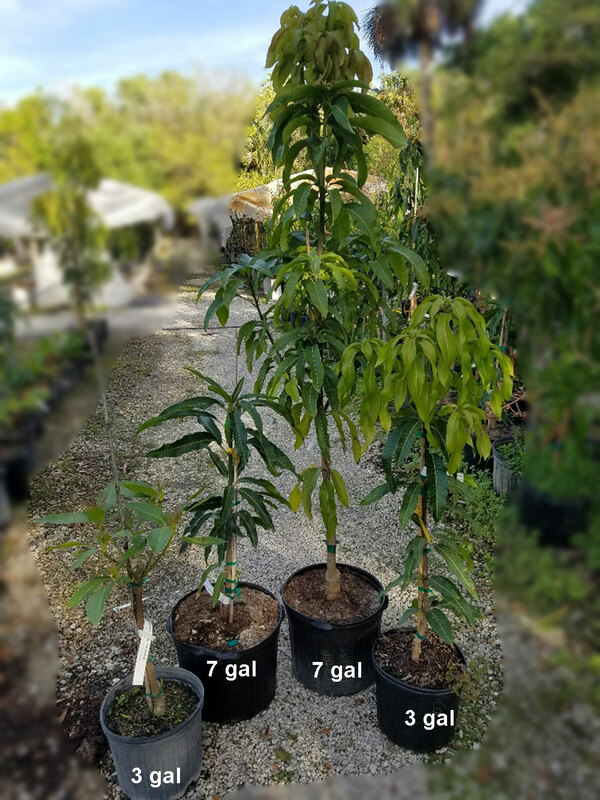 Fast growing but very compact tree; it starts flowering at young age within 1-2 years from seed, as small as in 1 gal container. 7 gal pot. 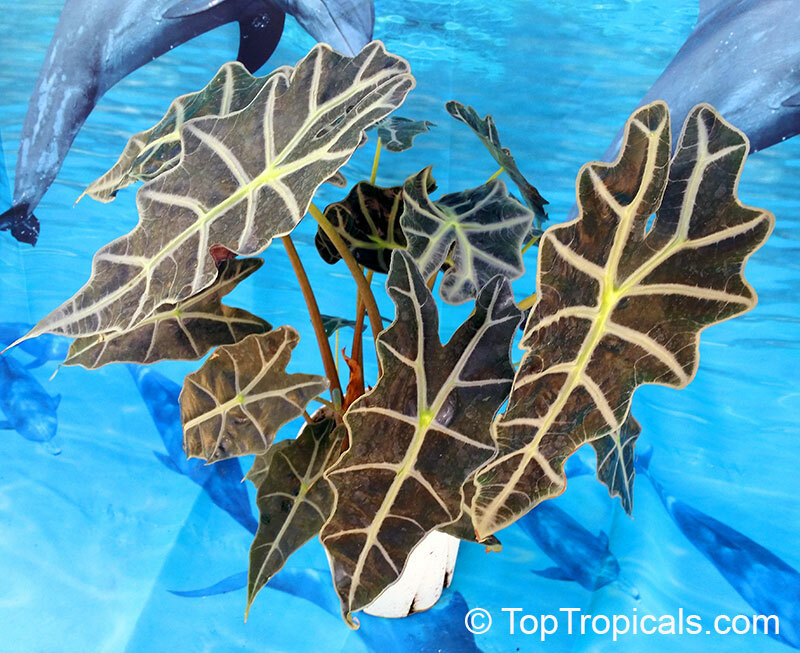 This plant is grown in 7 gal pot, more mature than our standard size plants in 3 gal, has a more developed root system, and most of the time thicker trunk and more branches. However actual plant size may vary depending on the growing season and on variety. Dwarf varieties are slow growers and may be shorter trees than upright varieties. See a picture showing the relative size of plants grown in 3 gal and 7 gal. 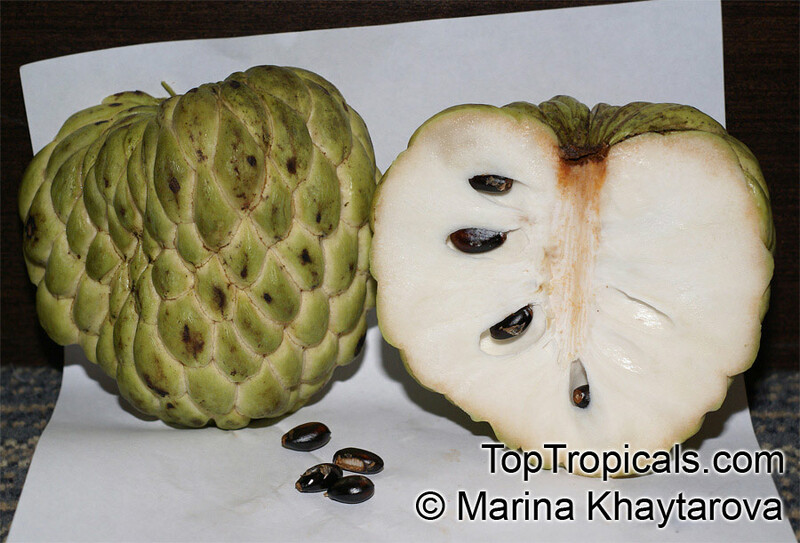 Sugar Apple, new rare variety Na Di (Na Dai) selected in Vietnam. 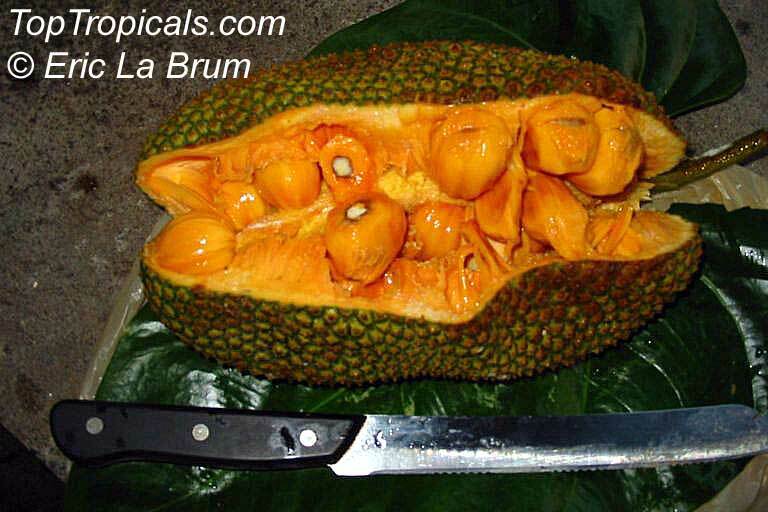 Superior variety, it has a green skin and very sweet white pulp. The fruit doesn't break apart like regular Sugar Apples when you open a ripe fruit, and the skin can be peeled off. Easy to eat off hand. Fast growing but very compact tree; it starts flowering at young age within 1-2 years from seed, as small as in 1 gal container. Panama Queen - a very rare plant with extremely tropical look, fragrant flowers of unusual color combination: orange and pink. 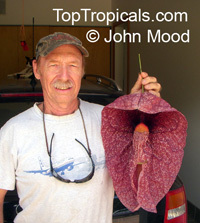 Aristolochia gigantea var. Brasiliensis is one of the most outrageous flowers in the world. 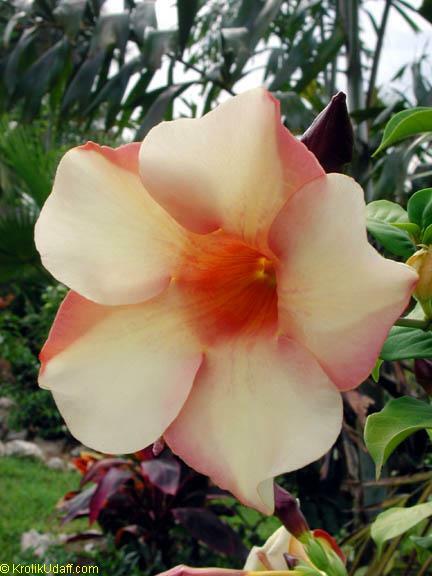 This species from Brazil has huge, over ten inches in length lemon-scented flowers and exhibits an elaborate pattern of white and mottled reddish brown. 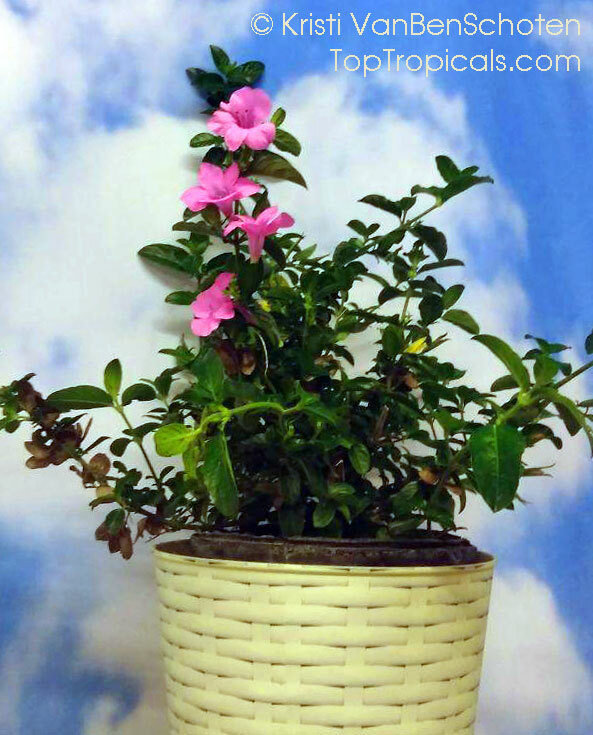 Since it is not a vigorous vine, it can easily be trained on a stake, trellis or even a hanging basket. A most interesting fly catching, carnivorous plant, this variety is a rare collectible. 2734 Artocarpus heterophyllus - Jackfruit Black Gold, grafted ? 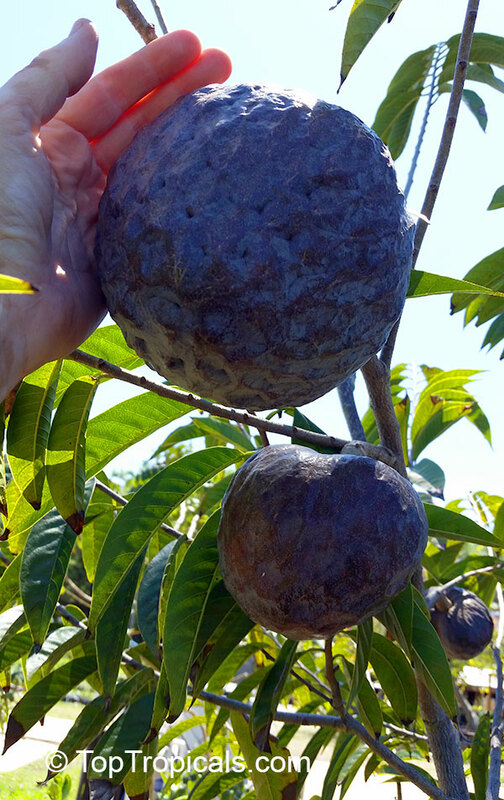 Black Gold Jakfruit originated in Australia. The tree is vigorous and with regular pruning can be maintained at a height of 8-10 ft. 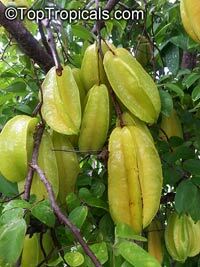 The fruit is has narrow shape, weighting 14-20 lb. It has dark green color with sharp fleshy spines, which don't flatten upon maturity. 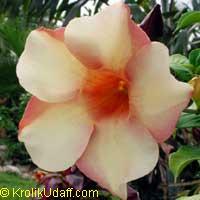 The deep orange flesh is very soft, with strong flavor and aroma. The flesh easily removed from the fruit comparing to other cultivars. 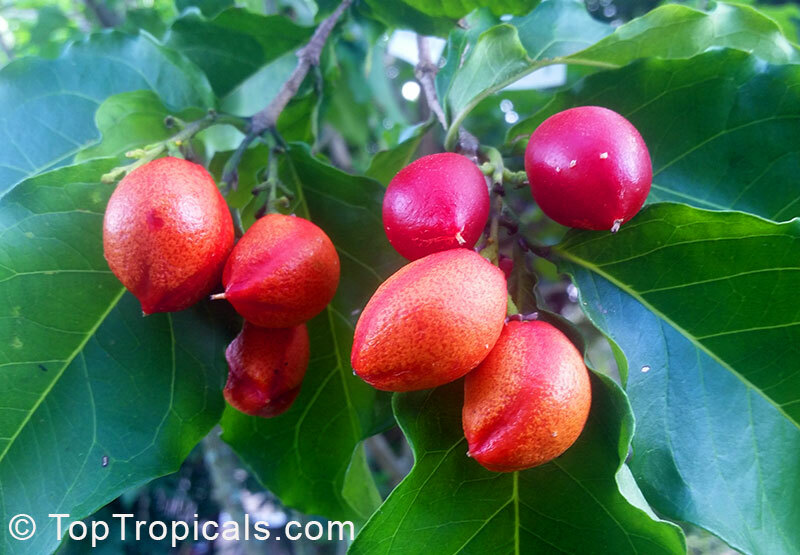 Fruit ripen in Fall in Florida. 3528 Averrhoa carambola var Bell - Starfruit, grafted ? 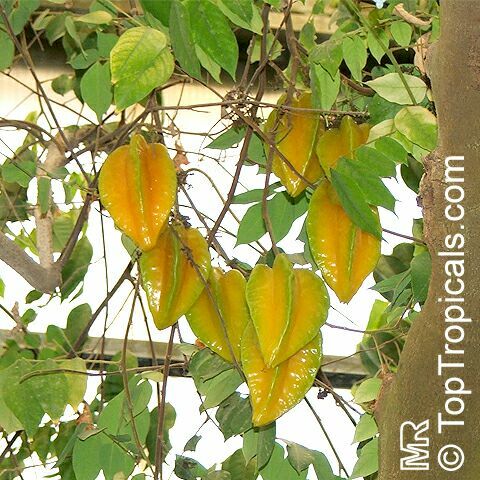 Carambola (Starfruit) var Bell. The fruit is large, round shape, golden color, sweet and crispy. Small symmetrical tree. Fruits very prolifically. Fruit is star-shaped when cut across the middle. It has a sweet, watery, slightly acid, pleasant tasting pulp. Eaten fresh, in salads, as garnishes, in drinks or preserved. Mature trees may survive light frost but young trees must be protected from frost and especially - wind. 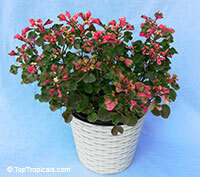 The plant will fruit in container even when in small size (2-3 ft). Season: August - March. 6023 Averrhoa carambola var Dwarf Hawaiian - Dwarf Starfruit, grafted ? 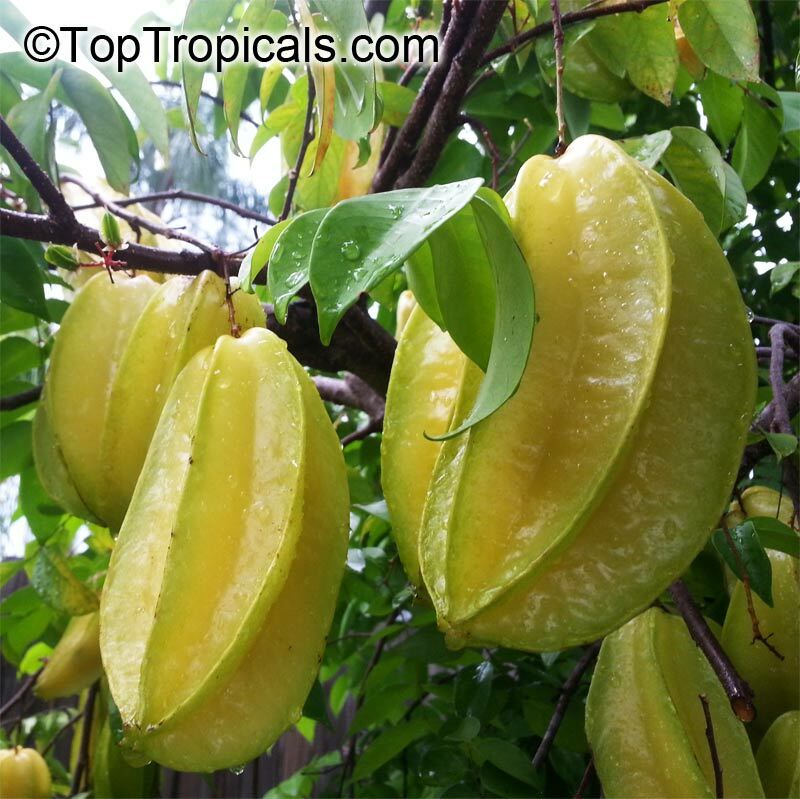 Rare and hard-to-find, Dwarf Hawaiian is a wonderful star fruit for containers since it produces an abundance of sweet, pale yellow fruit once it reaches 2’ in height. 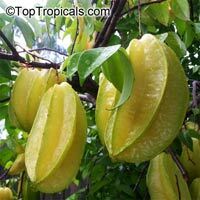 The fruit is as large as any commercial variety and it has a high sugar content and delicious flavor even when grown inside. See Article about this plant. 4506 Averrhoa carambola var Dwarf Maher - Dwarf Starfruit, grafted ? Carambola variety Dwarf Maher. 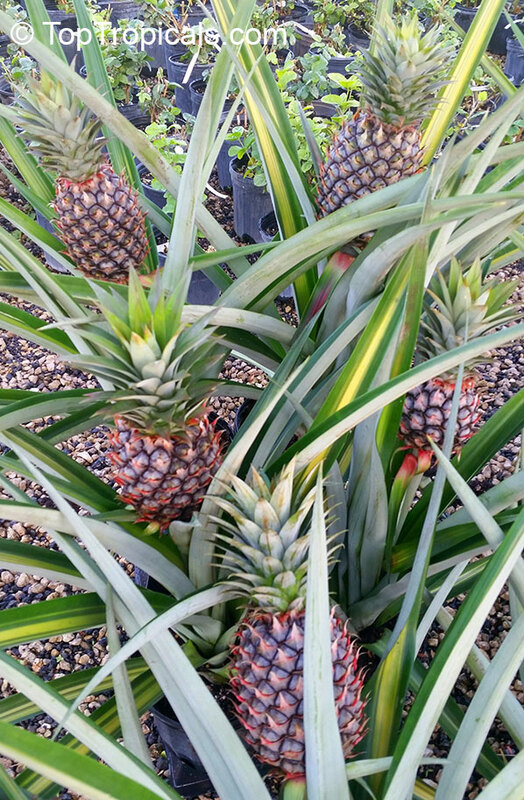 This Hawaiin variety has roundish fruit with light yellowish - white skin, white flesh, low acid content, sweet and crunchy. An abundant producer of sweet juicy fruit. Fruit starts forming at only 2 feet in height. Small size make it good choice for container culture. 4297 Averrhoa carambola var Hart - Dwarf Starfruit, grafted ? 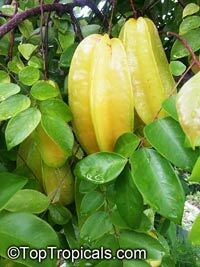 Carambola variety Hart - dwarf variety suitable for small backyard or container growing. Fruits are small with pale-yellow, almost white skin. Flesh is sweet and delicious. Eaten fresh, in salads, as garnishes, in drinks or preserved. Mature trees may survive light frost but young trees must be protected from frost and especially - wind. 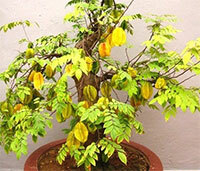 The plant will fruit in container even when in small size (2-3 ft). Season: August - March. Carambola variety Sri Kembangan - Thai variety with elongated fruit, 5-6 inches long, bright yellow-orange flesh, very sweet and juicy. Firm flesh and few seeds make it excellent dessert fruit. 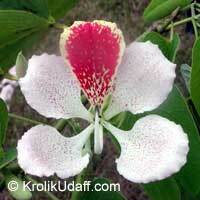 Napoleon's Plume Orchid tree - rare variety with cream-and-red flowers. 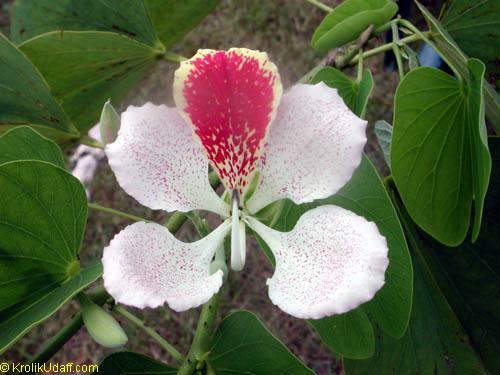 The most "orchid-like" looking and exotic Bauhinia flower. This species is more cold sensitive than other bauhinias, and doesn't like cold winds. Plant in wind-protected areas. The slightly fragrant flowers are reminiscent of showy orchids, with five irregular, usually slightly overlapping petals in shades of magenta, lavender or purplish blue. Great landscape shade tree. 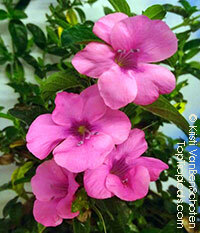 New variety with large pink flowers with "whiskers". Angel Trumpet - small tree or bush with pink trumpet-like fragrant flowers that change color from white (bud) through yellow to pink (mature). Very popular garden favorite. Fast growing. 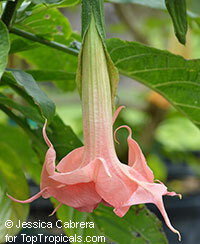 RECOMMENDED FERTILIZER: Angel Trumpet Delight - Smart-Release Booster. Peanut Butter Tree. One of the most fascinating exotic fruit, as amazing as Miracle fruit, Peanut Butter Fruit is loved by both kids and adults. Yes, it tastes exactly like peanut butter! Sweet, soft pulp with peanut flavor. 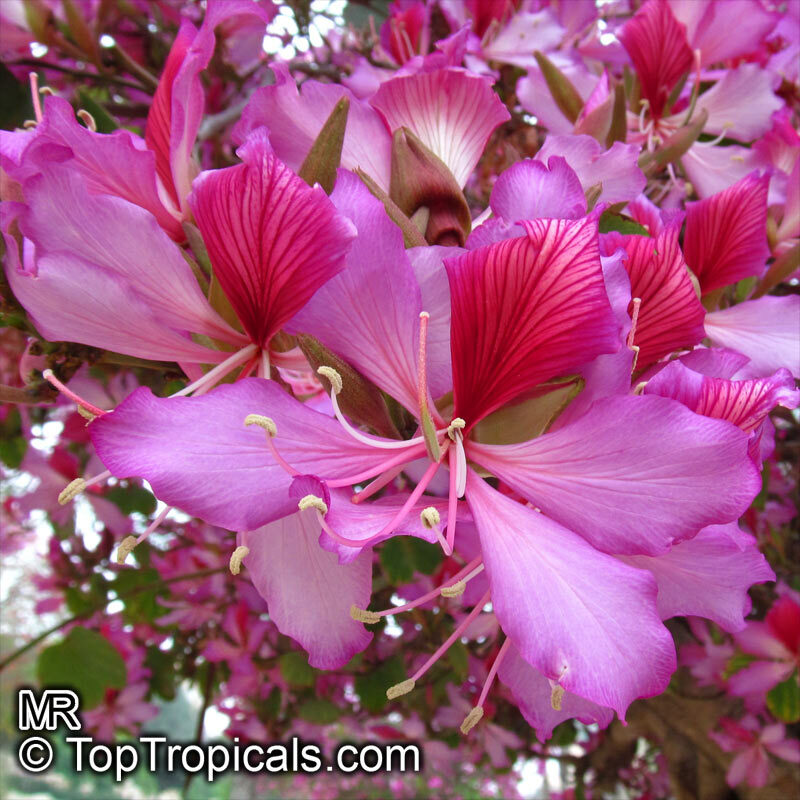 The tree is small in size, grows 10-15 ft max, or can be kept as a bush. Starts fruiting within 2-3 years from seed! 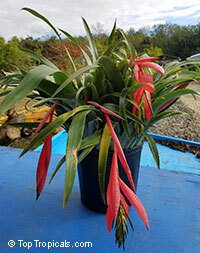 Keep it in a pot if you have limited space, can be grown indoors, too. This attractive tree has clusters of yellow flowers that are followed by an abundance of dark red fruit. The rich, sweet flesh has a texture similar to peanut butter. The fruit can be eaten fresh or made into milk shakes. Very rare in cultivation.